This feature is available in the Premium and Enterprise subscriptions of One Stop Order Processing. For a full video tutorial on how to setup automated stock control, click here. 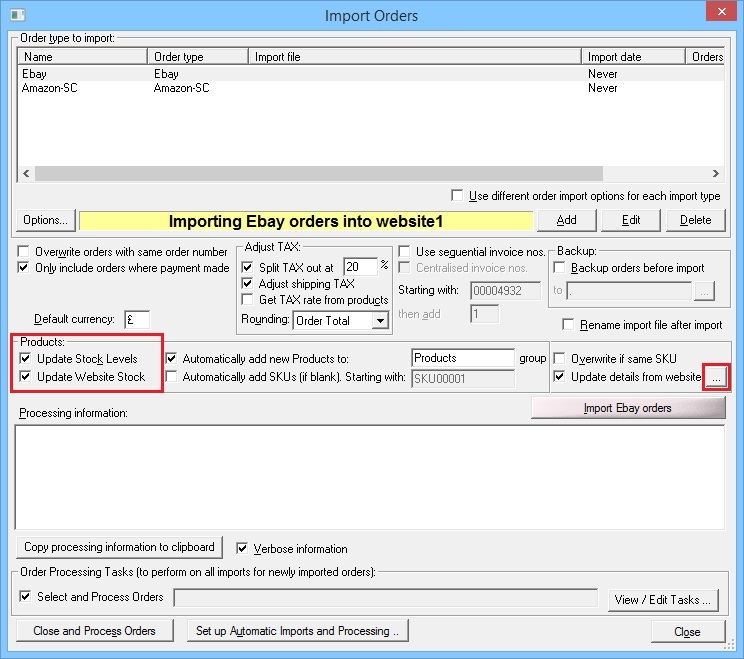 Using any Premium or above version of One Stop Order Processing you can automatically update the stock levels on Ebay and Amazon. For example, When you sell an item on Ebay, Amazon will then be updated with the new stock level. This is a very useful feature which you can use to save time on checking and manually amending the stock levels between your stores on different selling channels. There are a few options to turn on the stock control which you will need to tick to start using this feature. Shown below, if you go to Tools / Options / Other tab, you will see Ebay , Shopify and Amazon options under 'Website Stock Control'. Tick these and click OK. 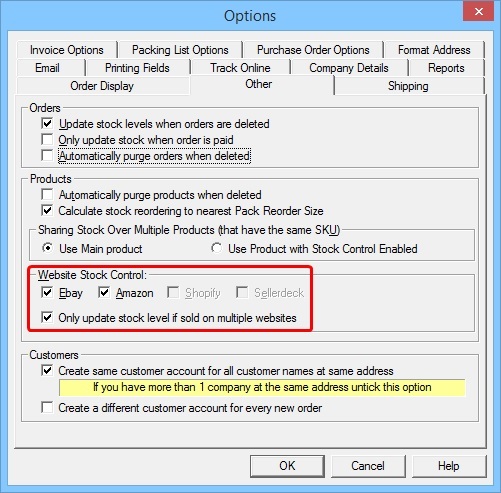 In the Import Orders dialog, there are two options to tick called 'Update Stock Levels' and 'Update Website Stock'. This means for products that have been setup for automatic stock control they will be updated from now on. 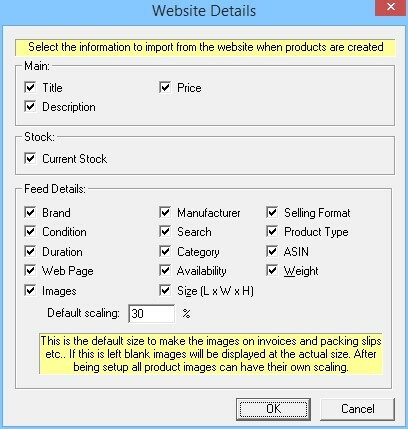 When clicking on the '...' button, the Website Details dialog will appear, by ticking all of the options shown here all of the products information will get imported. Now you have set up the stock control options in One Stop Order Processing, you will need to make sure the products are set up correctly. The following instructions will show you what to do to make sure your products ready for stock control across the selling platforms. You can now import your active listings from both Ebay and Amazon, when these are imported they will have the correct connection setup so that the stock can be tracked. To download and import your products from Ebay and Amazon, go to the Manage Products dialog, then Products / Import / From Websites. You will then select which store to import your products from and whether to overwrite products that have already been setup or to ignore ones that already exist. 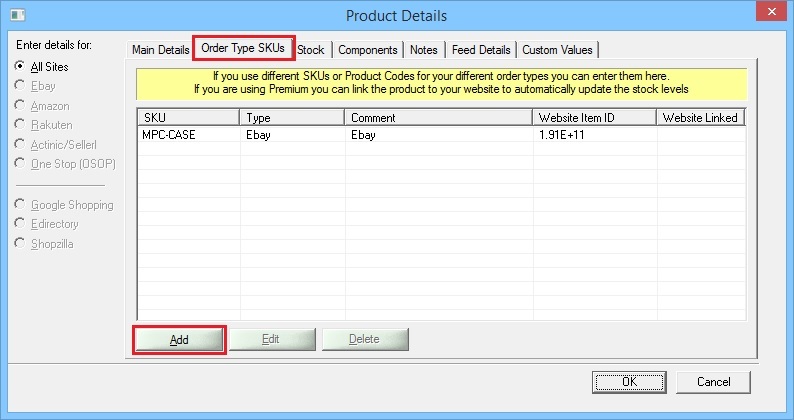 If you go to Products / Manage / open up a product and go to the 'Order Type SKUs' tab. This is where you will see the connections that have been created where you have the stock control enabled for. A connection will look similar to the one below, this is for an Ebay store. You will need to add one of these connections for each store this product is sold on. To manually create a new connection, click on 'Add' and you will see the following dialog. For a connection to be made, you will need to select the sales source in the 'Type' field, add in the 'Website Item ID' which is the SKU used for the item sold and add in the connection by clicking on the 'Add Website Connection' and selecting the import that you have this product set up in. Once you have set all these up, you will be able to have a parent stock quantity across your various selling channels and have the stock left updated when you sell and import these orders into One Stop Order Processing. To upload the current stock levels you have set up in your product in One Stop Order Processing, tick the products to update the websites with and go to Stock / Update Websites with Stock Levels.